I've had this dome in storage for quite a few years waiting for the day when I retired and moved back to the country. Well, it's now sitting at the new site in West Virginia waiting to be assembled. Click the link below for more details of the new observatory plans. 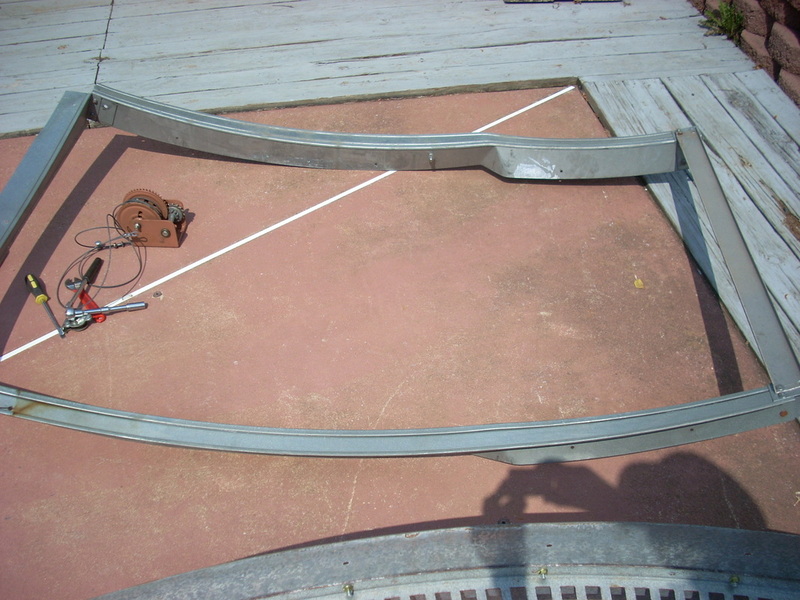 I purchased this unassembled 12' galvalume metal observatory dome on AstroMart in January of 2012. I was told by the seller that this observatory dome is one of only two made by Lancaster Domes in Lancaster, PA in the early 1990's and is apparently the only one still around. This dome was said to have been a prototype of a dome built for an amateur astronomer who was one of their big customers. That dome, as the story goes, was shipped to Ohio, where it was used until the owner passed away and has since been demolished. This prototype dome is a modified silo dome and appears to be closely modeled on an Ash Dome. It came with a set of uncut dome panels so if it was previously assembled as a prototype then the original panels were replaced with new panels when it was sold. I also received a generic Lancaster silo dome manual which explains panel assembly, but contains no information on how the custom base ring, aperture shutters and shutter tracks go together. I did find a document online with some details on assembling an Ash Dome which helped decipher such things as base ring and roller assembly. Unfortunately it's not a full construction manual. One difference from the Ash Domes I've seen in photos is the two-piece rolling shutter (one longer section and one shorter) in addition to the drop down door in the front. I probably won't figure some of this out until I actually start assembling the thing. 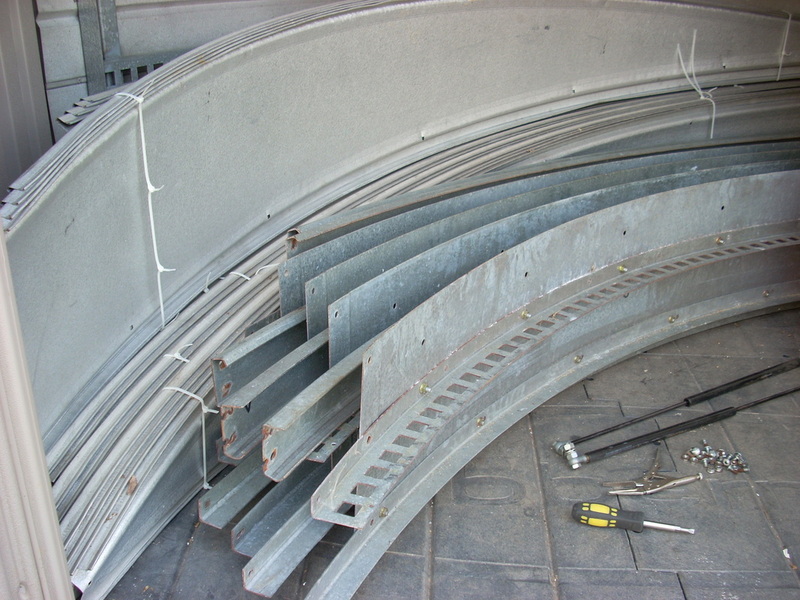 Dome panels and base ring sections. 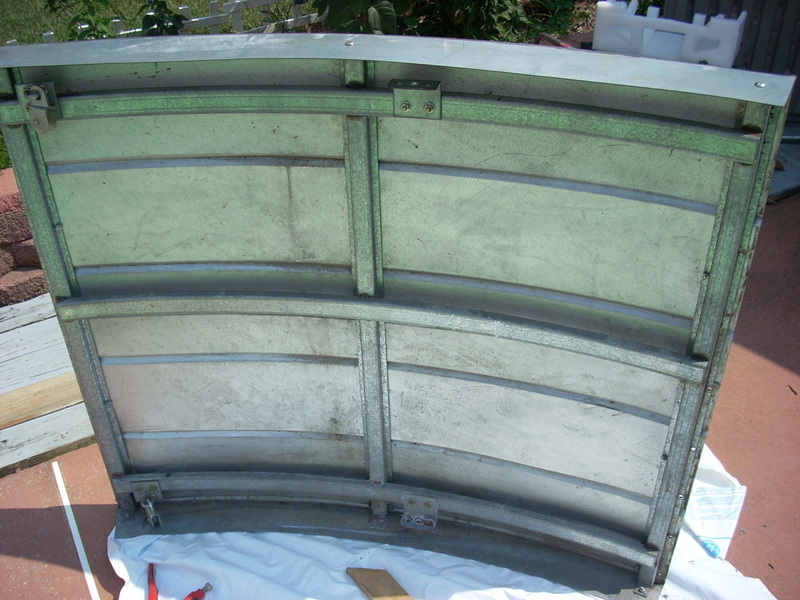 The panels are galvalume while the base ring and track sections are galvanized. Lower aperture fold out door. 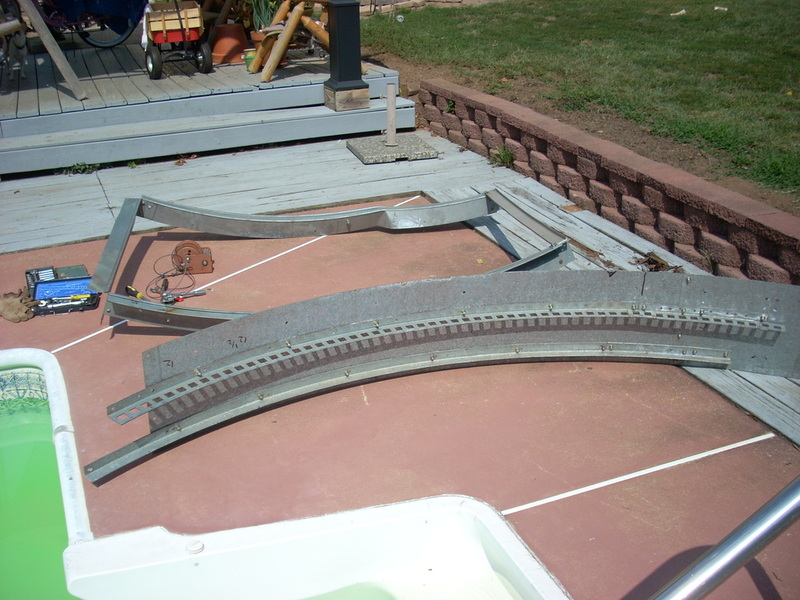 These two sections of the shutter aperture tracks were damaged when I purchased the dome. Hopefully this won't be too hard to correct. Dome ring section. There are six sections to the ring. The diameter is marked as 12-1/2 feet, but I have not assembled the sections to confirm this. 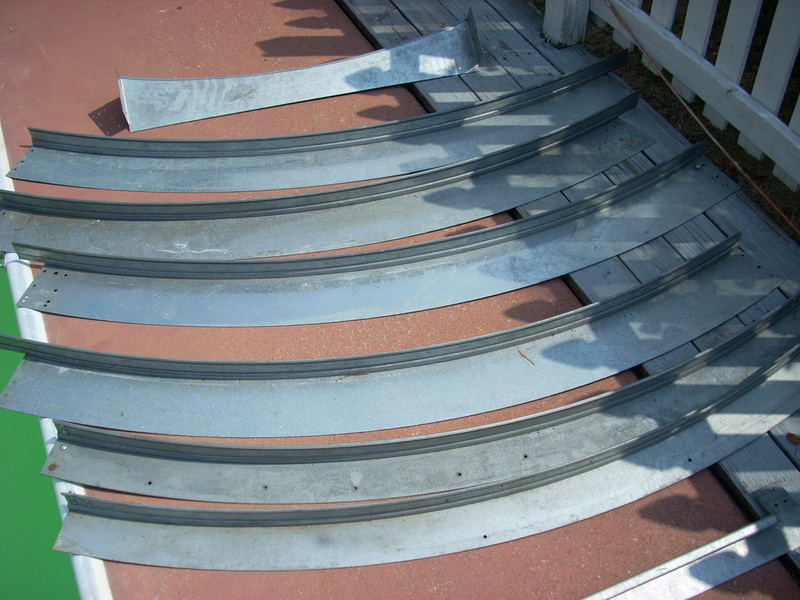 These look like parts for the shutter tracks. 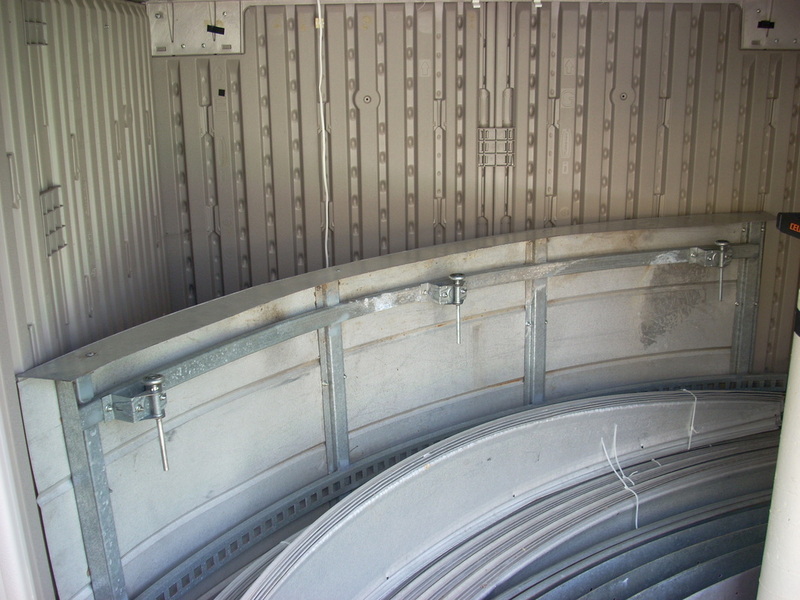 The larger main shutter section sitting behind the dome panels. I purchased these actuators for opening/closing the lower aperture door of the dome. They will replace the cable winch that came with the dome. The actuators are 38 inches long closed and extend an additional 30 inches. Hopefully I can make them work. The actuators are rated at 12VDC @ 1.25A (no load) at 150RPM. That sounds like a lot of RPMs but it's not when you are just turning a lead screw. This is a picture of the azimuth motor I plan to use on the dome azimuth drive. There is an electro-mechanical brake on the motor rated at 500 in-lbs. I purchased this motor online from The Surplus Center, but they have since sold out. The motor was originally for extending a slide out on a camper. I also purchased a 12VDC 25A DPDT relay to control the motor direction. For comparison, one of the Exploradome automation packages uses a motor rated at just under 200 in-lbs of torque at 11 RPM to rotate the 8-foot Exploradome, which weighs in at about 225 lbs. I estimate this dome to be in the 500 lb range so I think this motor will do the job. To power the azimuth motor I plan to use an old Compaq server ESP115 switching power supply. The 12-volt output of this supply is rated at 30 amps. I also use one of these to power the ExploraDome drive. The dome rotates on 23 garage door rollers. I went the extra expense and ordered commercial car wash door rollers. They are 3-inch diameter polyethylene, sealed bearing, 4-1/2" stainless steel shaft rollers meant to survive wet environmental conditions. They are much higher quality than residential garage door rollers and should provide many years of trouble-free operation. The shutter rollers are 2-inch nylon, sealed bearing rollers with 6-1/2" zinc-plated stems. Not quite as high quality as the stainless steel dome rollers but still much better than standard residential garage door rollers. These are slightly larger in diameter than the metal wheels now on the shutters and I'm hoping that won't be a problem. But I won't know for certain until assembly time.